Immunogen: Recombinant human cyclin D1. Scientific Background: Cyclins are a family of proteins which function as the regulatory subunits of cyclin/cyclin-dependent kinase (Cdk) holoenzymes, mediating entry into and progression through the cell cycle. Each cyclin is expressed in a temporal fashion during the cell cycle, partnering with a specific Cdk to activate its protein kinase activity. The most well defined mitotic cyclins are: cyclin D, which partners with cdks 4 and 6 during early G1 phase; cyclin E, which activates Cdk2 in the G1 to S phase transition; cyclin A, which utilizes Cdks 1 and 2 during progression through S phase and into G2; and cyclin B, which activates Cdk1 in M-phase promotion. Western blot analysis of ZR- 75-1 (1), MCF7 (2), HeLa (3), WR19L (4) and NIH/3T3 (5) cells probed with Cyclin D1 mAb (5D4). Immunoprecipitation analysis of cyclin D1 from ZR75-1 cells with Mouse IgG2a (1) or Cyclin D1 mAb (5D4) (2). After immunoprecipitated with the antibody, immunocomplex was resolved on SDS-PAGE and immunoBlotted with 553. Flow cytometry analysis of Cyclin D1 expression in HeLa cells. Open histogram indicates the reaction of Isotypic control to the cells. 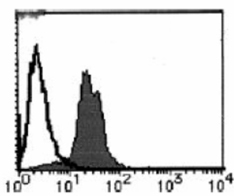 Shaded histogram indicates the reaction of Cyclin D1 mAb (5D4) to the cells. 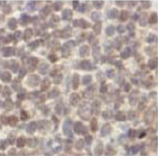 Immunohistochemistry analysis of Cyclin D1 on paraffin embedded section of human mantle cell lymphoma with Cyclin D1 mAb (5D4).